Where is your carbon footprint when you need it? This week the same people who advertise their virtue with climate cloaks are advertising their status with a Bombardier 7500. Don’t call them hypocrites, it’s completely consistent. Both are pretentious attempts to peck up the order. Perhaps its all because of jet envy. At least 1,500 private jets are slated to arrive in Davos. The number is up from last year’s estimated 1,300, according to the Air Charter Service, which also found that this year’s jets are larger and more expensive. Why more and bigger jets? “This is at least in part due to some of the long distances traveled, but also possibly due to business rivals not wanting to be seen to be outdone by one another,” Andy Christie, the private jets director at ACS said in a statement. Would you like a helicopter with that? 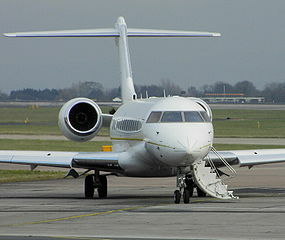 PrivateFly.com [points out] “The primary airport used by private jet customers flying to Davos is Zurich Airport. This is 148 kilometers away, or 1 hour 45 minutes by road. So some visitors will also charter a helicopter for a faster transfer time,” the company said. To be part of the global hero’s club, you just need to be seen talking about it.